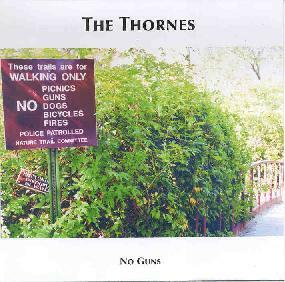 The Thornes - "No Guns"
The band describes themselves in the paper sent with the CD as a garage version of krautrock or proggy psychedelic retro rock. It is your choice??? If you go to the web page they are called Progressive Stoner rock. The band are from Berlin and are a four piece lead by Claudia Dark on guitar and vocals in addition to bass, drums and organ. The band in some incarnation have been around since 1993! I would have to say that the music on the CD prominently features Claudia's vocals. The opening track ("Be A Star") is quite a jamming rock foot stomper! Nice wah fuzz solo at the end. "Babutschka" is like a polka mixed with Rock. Her vocals, sung in a deep range, really remind me of someone but I just can't place it. A lot of the record features a 60's retro style organ playing but is quite cool. "Stay" begins with a bass line upon which the guitar and organ flow on top. The band have written some great songs and play very well. After hearing the CD a couple of times, I don't know where the Krautrock description comes from and I don't hear any stoner rock either, but a psychedelic retro rock sound is more fitting. This is definitely not Stoner rock. Check them out on the web. For more information you can visit The Thornes web site at: http://www.thornes.de. Contact via snail mail c/o Kalle Felyel; Sildiner Str. G; D-13359; Berlin; Germany.